Because of the Seminary's adherence to the magisterium of the Church, it wholeheartedly rejects the heretical teachings of Vatican II. Our Seminary is distinguished from other seminaries by its emphasis on the sacred liturgy. We apply the principle of epicheia and reject the early reforms made by Annibale Bugnini - intended by him as a bridge to the Novus Ordo. The Seminary adheres to the 1917 Code of Canon Law & rejects the new discipline containded in the New Code of 1983. 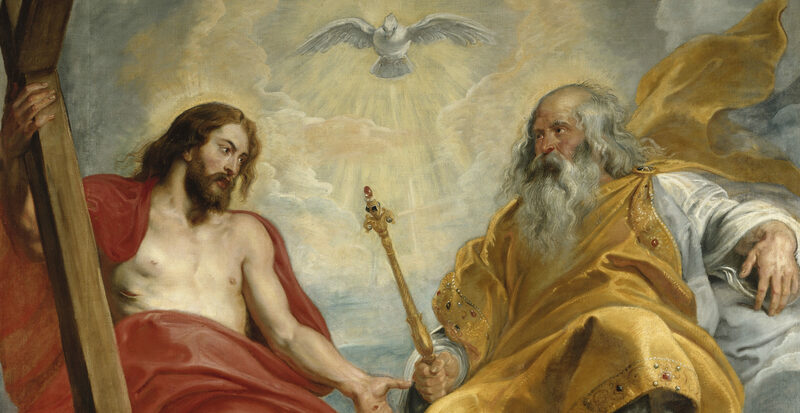 Most Holy Trinity Seminary professes and adheres to everything which is contained in divine revelation, whether written or handed down, and which has been proposed by the Church as having been revealed by God either by her solemn judgment or by her ordinary and universal magisterium. Because of the Seminary’s adherence to the magisterium of the Church, it wholeheartedly rejects the heretical teaching of Vatican II concerning the unity of the Church, namely that the Church of Christ is not exclusively identified with the Catholic Church, but merely subsists in it. This heretical doctrine is contained principally in Lumen Gentium, and its heretical meaning is confirmed in statements of Paul VI and his successors, particularly in the 1983 Code of Canon Law, in the 1992 Statement concerning Church and Communion, and in the Ecumenical Directory. It is contrary to the teaching of the Catholic Church, contained principally in Satis Cognitum of Pope Leo XIII, Mortalium Animos of Pope Pius XI, Mystici Corporis of Pope Pius XII and in the condemnations of the “Branch Theory” made by the Holy Office under Pope Pius IX. The Seminary also rejects the teaching of Vatican II concerning ecumenism as overtly heretical, which states that non-Catholic religions are a means of salvation. This doctrine directly contradicts the teaching of the Church that there is no salvation outside the Catholic Church, called by Pope Pius IX a “most well-known Catholic dogma.” In addition, the ecumenical practices which have resulted from this heretical doctrine are directly contrary to Mortalium Animos of Pope Pius XI. The Seminary rejects the teaching of Vatican II on religious liberty, contained in Dignitatis Humanae, which nearly word for word asserts the very doctrine which was condemned by Pope Pius VII in Post Tam Diuturnas, by Pope Gregory XVI in Mirari Vos, by Pope Pius IX in Quanta Cura, and by Pope Leo XIII in Libertas Praestantissimum. The teaching of Vatican II on religious liberty also contradicts the royalty of Jesus Christ in society as expressed in Quas Primas of Pope Pius XI, and the constant attitude and practice of the Church with regard to civil society. The Seminary furthermore rejects the teaching of Vatican II concerning collegiality, which attempts to alter the monarchical constitution of the Catholic Church, with which she was endowed by the Divine Savior. The doctrine of Vatican II, confirmed by the 1983 Code of Canon Law, which states that the subject of the supreme authority of the Church is the college of bishops together with the pope, is contrary to the defined doctrine of the Council of Florence and of Vatican I. The Seminary adheres to the Catholic liturgy of the Roman rite, pristine and untouched by the Modernists. Consequently the Seminary rejects the Ordo Missae of Paul VI as an evil liturgical discipline, because (1) it contains a heretical definition of the Mass; (2) it was composed with the express purpose of making an ecumenical liturgy, pleasing to Protestants, stripped of Catholic truths concerning the priesthood, the Holy Sacrifice of the Mass, and the Real Presence of Christ in the Holy Eucharist; (3) it was composed with the help and input of six Protestant ministers, which shows the heretical spirit in which it was conceived and formulated; (4) its authors systematically deleted from its prayers and lessons doctrines which would be offensive to heretics; (5) it teaches, both by its omissions and its symbolism and gestures, heresies and errors concerning the priesthood, the Holy Sacrifice of the Mass, and the Real Presence of Christ in the Holy Eucharist; (6) it is most probably invalid owing to a defect of intention which it causes in him who celebrates it, and owing, at least in the vernacular, to a blasphemous alteration of the words of Christ in the consecration formula. The Seminary furthermore rejects the Vatican II reforms of the other sacraments, which participate in the same spirit of ecumenical apostasy. Notable among these is the Vatican II rite of Orders, which has deleted the notion of a sacrificing priesthood and has substantially changed the form of the sacrament from that set down by Pope Pius XII in Sacramentum Ordinis. The Seminary also rejects the reforms of the Missal and Breviary made in 1955 and thereafter, because they were designed and concocted by the same Annibale Bugnini, the author of the Ordo Missae of Paul VI. When seen in the subsequent light of the ultimate reforms of Vatican II, it is clear that the 1955 reforms of the Mass and of Holy Week in particular are inchoately the same reforms as those of Vatican II. The legal justification for the rejection of these rites, which were promulgated by a true Roman Pontiff, is the principle of epicheia, since if there were a Pope reigning at the present time, it is reasonable to presume that he would not want these inchoative changes to be used by the Church. The Seminary adheres to the 1917 Code of Canon Law. The Seminary consequently rejects the 1983 Code of Canon Law because (1) it is promulgated by John Paul II, a false pope, who has no jurisdiction to make any laws for the Catholic Church, owing to his promulgation of the Vatican II heresies and errors; (2) it contains the heresy of Vatican II concerning the Church, mentioned above; (3) it permits sacrilege to the Blessed Sacrament, by approving of its reception by non- Catholics, which is a mortal sin; (4) it permits communicatio in sacris with non-Catholics, which is a mortal sin. The Seminary offers as its legal justification for its existence, and of the apostolate of those priests who shall emanate from the Seminary, the principle of epicheia. In the absence of the lawmaker, i.e., a true Pope, one may reasonably presume that it is the will of the Church, and therefore lawful and even required of the faithful, especially the clergy, to carry on the mission of the Church to save souls. And since this can only be done by the offering of the Holy Sacrifice of the Mass and the distribution of Sacraments, it is required that the clergy make every effort to accomplish this end.